What does family mean for individuals and modern society? In China, where society has been in transition for more than 30 years, the answer is rather complex. On the one hand, the family has its vulnerabilities and limitations in context of profound social transformation. On the other hand, either for the individual or the state, it is indispensable in the sense that it is the basis for upholding the human community. Such a seemingly paradoxical existence has to be attributed to the fact that family has always been regarded as a static unit in the social structure rather than a dynamic one. This article aims to examine the mobility of Chinese families and how the family retains vitality and resilience amid vast social change. In a broad sense, family mobility could be broken down in the following aspects. First, it refers to the movement of family in time and space. According to the family life cycle theory in demographics, a family typically experiences different evolutionary stages and processes from formation, expansion, stabilization, contraction to empty nest and disintegration. This longitudinal change is accompanied by the intergenerational change of members. Meanwhile, in the context of frequent population migration, families’ spatial change has become the norm in China, which also triggers a series of collateral effects. Second, family’s time-space mobility adds complexity to family structure. For example, the flow of migrant workers creates a phenomenon of family discretization, spawning a batch of left-behind families, mobile families, intergenerational families and other “split-up” families while producing a large number of children who attend boarding schools and grandparents who accompany the child to study in one place. Thus, the traditional form of cohabitation has been replaced by more complex and flexible family forms. Such arrangements will not cut blood ties and kinship, but they could lead to the adjustment of family function to meet the needs of each member to the utmost degree. Third, the most fundamental change brought by family mobility is embodied in the alteration of the family’s organizational form and the shift of power relations between members. With the dual effects of demographic policies and society, family size is becoming smaller, and the divorce rate is increasing, while the marriage rate is decreasing. The nuclear three-member family has changed little in its relative size, while the incidence or size of the three-generation extended family has continued to decrease. Also, the postponement of marriage and childbearing are prevalent in contemporary Chinese society. Though the nuclear family and extended family continue to be the dominant family structures, other forms are on the rise, such as single-parent, dual-income no kids (DINK) family, empty-nest elderly, single-person household and pre-marriage cohabitation, forming a mobile, pluralistic family structure on the whole. In addition to social institution and background, family mobility is closely associated with the transformation of cultural logic and value orientation. For over 30 years, China has seen mounting social problems amid market reform. On the one hand, people have more opportunities and choices for personal development while their appetite for consumption and pleasure has been further unleashed. On the other hand, the risks associated with market and society transition are difficult for individuals to handle on their own and thus are transferred to family units. In a sense, family mobility can be seen as a way of coping with the risks of globalization and modernity. That said, family mobility, though it seems to be a passive choice, indeed reflects the instrumental function of family and such a recognition is gaining ground in today’s China, which is why “a match of wealth and status” and certain material conditions are regarded as the prerequisite of modern marriage. To some extent, family is the safety mechanism of social security. Family mobility affects a range of generations, genders and classes of people. While it could be a safeguard against social transformation and modernity, it could also be the biggest risk for individuals, which explains the fragility of modern families. 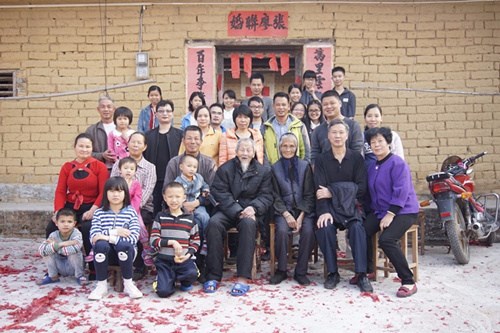 An observation of the diverging interpretations of interest, values and emotion among two generations of people could lead us to a better understanding of modern Chinese families that blends tradition and modernity. All the aforementioned theories have exposed the contradiction between individualism and collectivism espoused by the traditional family ideology. To solve this problem, people yearn for a flexible, pluralistic and open family model. Therefore, it is safe to say that the formation mechanism of family mobility is that people break out of the original framework and concepts of family patterns, relationships and structures and achieve a real transformation in marriage and family perception. This change is accomplished in the real experience of a variety of Chinese families in the transition period. Family mobility needs to be presented as an independent concept because it alters the passive and traditional role of family in the classical theory of modernization and is endowed with some practicality and subjectivity. Home is no longer the embodiment of certainty, stability or security, but a living and sometimes risky practice. This kind of perception not only has methodological value in family and social research but also important policy implications. To start with, family mobility means fundamental changes in the way people define families. The shift from focusing on household structure and lifestyle to a more emotionally connected family environment coincides with the changing emphasis of modern Western family research from family structure to family relations. At the same time, the shift also avoids the limitation of past research, which used household as the main unit in social surveys and analysis. Next, family mobility also embodies the structural nature of a family unit. Family in this sense is a way for people to define social relationships in their day-to-day interactions, which means that we should pay more attention to how people talk about families. Because this, along with the meaning assigned to families, affects how they define family members. Finally, family mobility offers an explanation for the coexistence of multiple family patterns and how it serves as a strategy to cope with social risks. The empirical study of many scholars has also proved the trend of regarding family as an emotional and instrumental haven as well as a form that coexists with individualism. The mobility of the family contains compromise, interaction and reengineering of various family concepts and practices, which reflects the practical orientation of family construction. In policy, family plays an important role from state governance to village governance. Yet, its public nature has not been fully revealed. For example, in the wave of new urbanization, policymakers tend to overlook the complex and changeable nature of mobile families, so the migrant worker-citizen plans and the policies of rural and urban governance turn out to be too vague. In a way, we need to realize that urbanization is indeed a process of family urbanization at its roots. However, in the current social policy mindset, there is a tendency to assume family as a passive recipient of social structure and system transformation. As discussed, the family, as a unit with cultural and social construction significance, not only affects individual perception and decisions within the family but also has a great impact in terms of social change. The approach of family mobility is in line with the principle of autonomy and consultation upheld in modern governance, so social policies that fail to incorporate it will be flawed. Wu Xiaoying is from the Institute of Sociology at the Chinese Academy of Social Sciences.